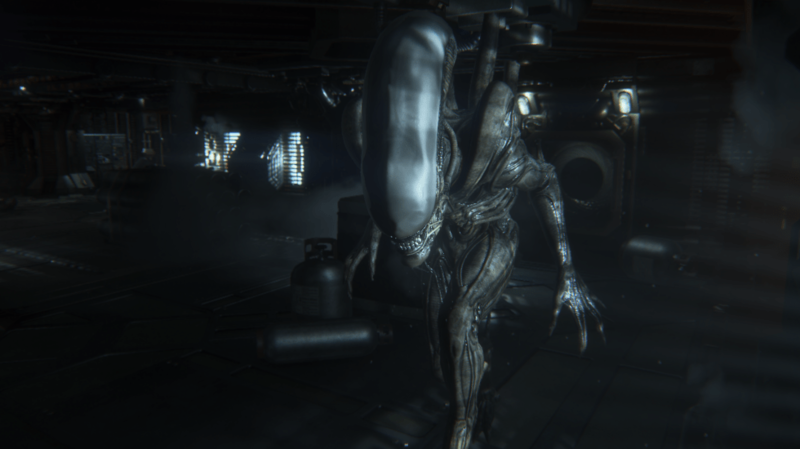 So Alien: Isolation is probably getting a Linux port. Is this news? Hardly. The number of games, including AAA games, that work or have been ported to GNU/Linux, and are simultaneously released for Linux has gone through the roof in the last couple of years. Getting more games working is a good way to get users using GNU/Linux. In fact, trolling forums, it is common to read comments like: “I would move to Linux, but my games…”. This excuse is getting weaker with every new title that comes out. Alien Isolation is coming to Linux. Surprised? Don’t be. Be afraid. Because, fortunately, the situation has changed over the last 4 or 5 years. Linux has become a seriously interesting and feature-complete gaming platform for developers. Many companies now port their games to Linux on a regular basis. Linux even provides some advantages in the way of efficiency and speed. And for those games that still don’t work natively, there’s always WINE or Play On Linux. Not only that, but many game distributors have a solid GNU/Linux strategy. Valve has its version of Steam for Linux and now offer a catalogue of more than 1500 titles. They even developed their own Linux distribution, SteamOS. GOG provides a full catalogue of classic and modern games that work on Linux, along with a Linux downloader. And Humble Bundle, which started making distributing games for all three major end-user platforms (Windows, MacOS X and Linux) one of its main raison d’êtres, continues regularly putting out titles that work on Linux. On a personal note, I have recently taken to trawling Boing Boing to see what games they recommend. Their choices are often hipsterish, retro and bizarre, but always original and far removed from the unimaginative Call of Duty and DOTA clones, something I find is refreshing. I don’t run Windows at all, but I still have to find a game they mention that won’t work on Linux one way or another. Of course, I may just have been lucky. Furthermore, the Unity, CryEngine, and Unreal engines, used to create many of the most sophisticated AAA games out there, all work on Linux, as do many other open and proprietary frameworks. But, however easy it is to create or port a game for Linux, it is still not clear if for-profit companies will see the point. Linux desktop users make up about 1% of all the desktop users in the world and the number of Linux gamers can only be smaller. Linux Mint recently ran a survey for its users and about half said they played games on the platform. If this is true for the rest of Linux desktop users, half of 1% is a pretty minute market-share to cater to. There’s also the small matter of having proprietary games running on Linux. This is not the best way to boost usage of Free Software. Seeing how the droves of Android users have not translated into a mass migration to other open source technologies, I don’t think that just by changing the underlying operating system is suddenly going to make everybody use LibreOffice, GIMP, and Thunderbird. And opening a game’s source makes its ability to make money and, hence, be sustainably developed, harder. Gaming is world in itself. While you can sell services and peripherial products around other software applications, such as consultancy, implementation, migration services, support, updates, documentation and training for, say, a productivity suite such as LibreOffice, more often than not nothing can really be sold with a game save for the game itself. Online games could possibly sell access to servers and there is always the possibility of having an in-game economy that can be translated into real money. But the former only really works for MMORPGs with, as the name implies, massive user bases. As for the latter, it has generally had a bad rap, and I don’t think it would work in an environment where all code were required to be open and could therefore be replicated without effort. Often the simplest answer is the best. There are always patronages, donations, crowdfunding campaigns and so on, i.e. the stuff that other Free Software projects use to fund their development. These things may work, but they also make me uneasy. Judging by past experiences, survivability rates of projects that go down that road, regardless of the quality of the end product, are very much hit and miss. I don’t have an answer to the question on how does a community make Free Software games become big and remain that way. Although, I would like to see a consistent, strong, and sustained FLOSS gaming offering, maybe it is just not meant to be long term. Maybe games, being the peculiar things that they are, can only be or proprietary, or works of love, always on the brink of disappearing. However that may be, there are still plenty of cool, free and open games out there. We have already mentioned Battle for Wesnoth (a Free Software classic) and Space Nerds in Space (a truly innovative and seriously cool game), and, in passing, Xonotic and Sauerbraten (a couple of exciting First Person Shooters) elsewhere in OCSMag; but there are many more in your distribution’s repository and, if you are not sure where to start, you can also check out Lee Reilly’s list of games available on GitHub. Note that not all software in that list is free (but all the programs have their source code available), not all games are for GNU/Linux (some are for iOS, or Android, or even exclusively for Windows), and not all are even games (the list includes engines, frameworks, assets and other goodies which you can use to make your own games); but this list is pretty awesome nonetheless. As for my personal favourites… well, first, full disclosure: I’m not all that much of a gamer nowadays. I was a decent Doom player way back when it still only worked on PCs and hadn’t been ported to everything, from an oscilloscope to your socks. I also loved point and click adventures and enjoyed the original Sim City immensely. I’m talking about the version you could play off a 3.5 inch diskette — oh, yes, I am that old. So, although I am still fascinated by games as a software genre, my choices and appreciation of what’s cool may seem weird or outdated. Bear in mind I am aware of this before judging. 0 A.D. is a real time strategy game set in the theoretical year 0 (Trivia Note: in the Common Era, aka the calendar used in the western world, there was no year 0 at all – we went from 1 BC to 1 AD). You control a civilisation of the day, be it made up by Iberians, Celts, Persians, Romans, or whtever. You have to jump start, grow and expand an empire, battling for resources with your neighbours. You can play in single mode against bots, join an online game, or host your own match. 0 A.D. is a pleasure to play because of the gorgeous (and historically accurate) graphics and animations. The game runs on MacOS X, Windows and is available in the repositories of most GNU/Linux distributions (search for 0ad). 0 A.D. is an ongoing project and you can contribute to making 0 A.D. better by patching and debugging the code, or, if you are an artist, by helping develop better graphics. You can also donate to 0 A.D. so the development can continue. I admit this one is in here because I love a good hand of the ole poker. Having said that, PokerTH’s simplicity and straightforwardness also contributes to making it a great game. PokerTH works on most platforms, including Android which means you can play while in bed or on the toilet from your tablet — not that I’d ever do that, oh no! 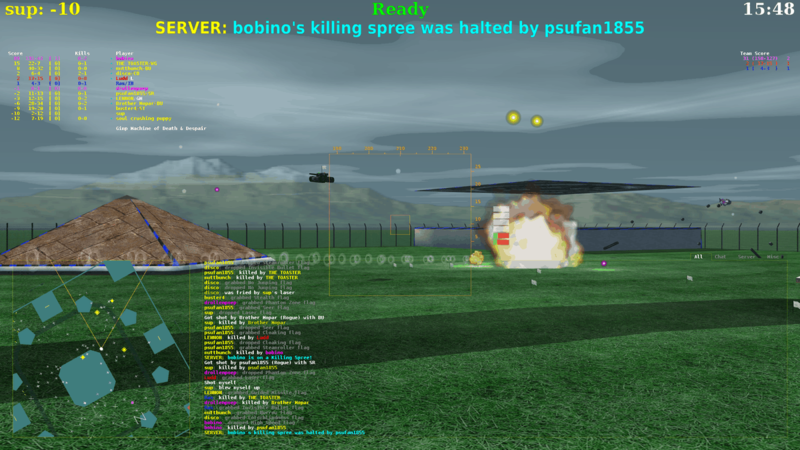 There’s a very lively player community, too. 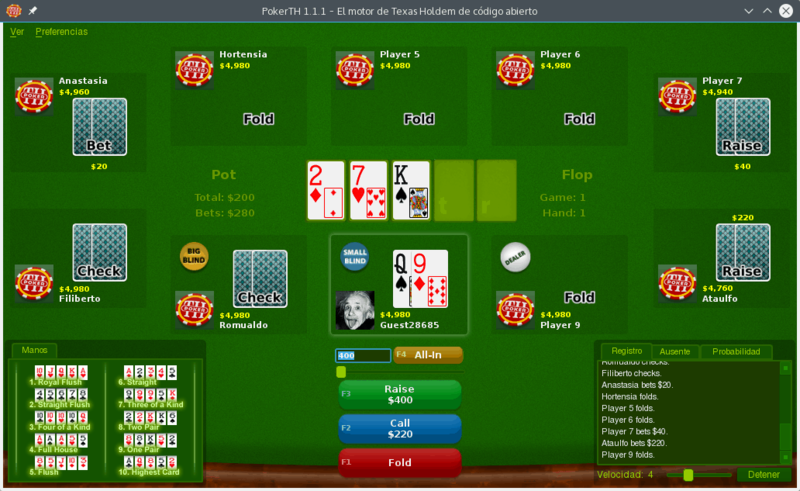 Go online and you can always find a table and play a hand. Setting up a local networked game for “poker night” with the lads is also a breeze. “Bzflagscreenshot” by hajatvrc. Licensed under CC BY-SA 3.0. This game has special place in my heart because it is the first game I played collaboratively with my son when he was no more than 5 years old. This was well before he metamorphosed into his current leary form, that of a teenage homicidal zombie-killer. BZFlag is a 3D first person shooter, but without any bloodshed. You play the role of a tank… er… that can jump. The violence is cartoonish, fast-paced and manic, making it fun and apt for all ages. There are plenty of weapons and modifiers you can pick up in the shape of flags that keep the gameplay fresh and exciting. As with 0 A.D. and PokerTH, it is easy to set up your own server and the options you have, combined with the possibility of designing your own playing fields, can make for fascinating and tactically rich multiplayer matches. There is also an Android version out there, but, trust me, you do NOT want this on your phone. Despite the less than ideal state of gaming on Linux and the moral dilemma closed source pograms pose to Free Software advocates, the situation has improved substantially. Both big titles and small indie games, closed and open, are getting made or ported more and more to free platforms. A wide range of open and proprietary engines and utilities help to keep this happening. Is your favourite Free/Libre game missing from the lists above? Probably. Share the titles you enjoy with us in the comments below and tell us why you love them. 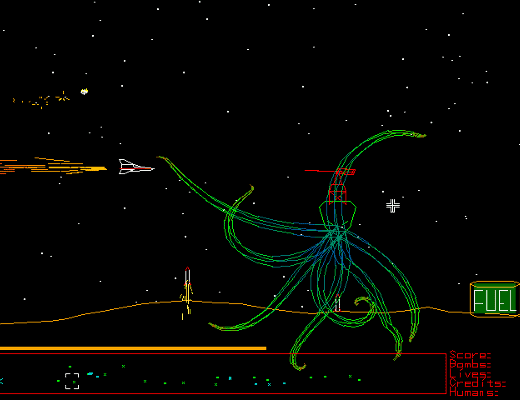 Cover Image: Screenshot from World War VI, a game by Stephen Cameron. Well I’ll throw in our website, Free Gamer (http://freegamer.blogspot.com), for Free software gaming enthusiasts. Also our forum, http://forum.freegamedev.net, which is also pretty active with several projects also using it including Super Tux Kart and Open Dungeons.